I decided to take my video making skills through another descend and ended up with what I hope is an entertaining and informative video of how I am farming for my Scarlet System. Audio is okay to listen to and the narration should be helpful. I also want to say that I am my own worst enemy and blame Mantastic for a near death experience at the end. Dungeon for reference. This round of One Shot Challenges gives players the chance to obtain up to 10 magic stones along with random piis, jewels, and other helpful rewards. However, the higher end floors are played on a 7×6 board and this presents an extra challenge through absorption shields and having boss mechanics augments to compensate for the bigger board. 7×6 boards place a heavier emphasis on dealing massive amounts of damage due to having access to 42 orbs. However, even with the additional 12 orbs, we do not have additional time extend to fully utilize their potential. Challenge 9 imposes the dreaded no awakenings restriction, but it is not as dangerous as it seems because the first floor only requires you to match jammers while the random pii floor can be bypassed with poison or other nukes. Scarlet Descended is still the scariest descend available and for good reason. She grants hardly any monster experience due less floors than other rogue descends as well as each floor giving less levels. This results in your team being severely underleveled by the time you reach the 7 million health boss. This is where plus eggs comes into play as they provide their full benefit regardless of monster level. Furthermore, the dungeon is very unforgiving as most things can execute you if you fail to deal enough damage along with very large health pools. New evolutions are out and bring many game changers to the table! Izanagi has fallen a bit out of favour while waiting for his new ultimate evolution. I felt he was being pushed out of the meta because his viability as a sub was being outshined by other options. In terms of descend capable teams, he would be a sub on , , and . With the advent of losing her god typing and gaining a higher scaling combo-based multiplier, Izanagi’s burst (and awakenings) can no longer benefit your two leaders and should not be used as a staple sub anymore. The dark typing is an amazing addition to the other light-based rainbow teams as you now have a stronger option than or if you do not need the shield. and teams are the only ones left who will truly benefit from his additonal and dark typing. 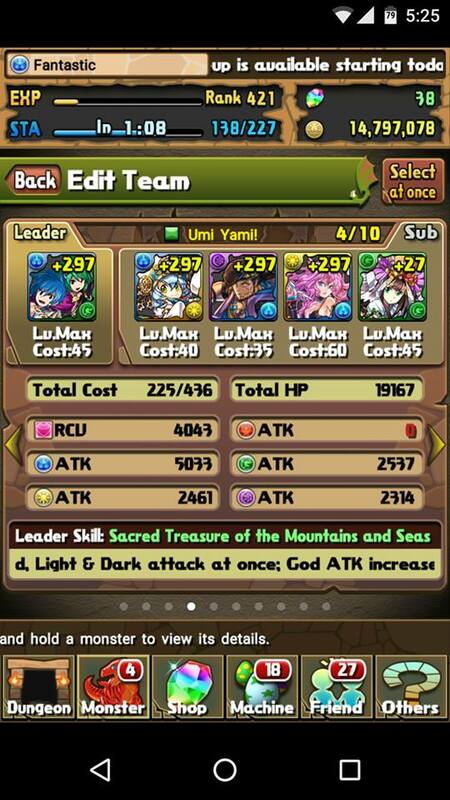 One other use for the new L/D evolution is the ability to cover all the colours for a team. This can allow you to choose three unrestricted subs and can help you go more mono blue. The Wonder Boys still retain their god typing, so the active is still beneficial. Overall, the new evolution is very welcomed, but just a little too small and too late to fully capitalize on release. Furthermore, I discussed the struggles that rainbow teams face in a previous Posting and Izanagi is still regulated being a rainbow sub that can now fulfill dark requirements.